The federal government issued a warning today about the SafetyCraft line of cribs, which is believed to be identical to a brand of cribs blamed in the deaths of three babies and puts infants at risk of suffocation or strangulation. The low-cost, drop-side cribs were made by now-defunct Generation 2 Worldwide, whose Childesigns brand was recalled a year ago after being connected to 20 other incidents, the U.S. Consumer Product Safety Commission said. Those who have the cribs mentioned in this recall are urged to get rid of them.The CPSC said it is unsafe to try to repair the cribs due to the plastic hardware that holds them together. Generation 2 shut down six years ago. But the government said the name was sold to an Ohio company, Foundations Children's Products, whose products are not subject to this recall. Foundations' version of the line can be identified by the Foundations imprint on the mattress-support assembly instructions. The dangerous cribs have a SafetyCraft label on either the headboard or footboard. The CPSC said that it doesn't know where or how many of the recalled cribs were sold, but are aware of their use in both homes and childcare facilities. Similar to other drop-side cribs, these cribs have hardware that can fail and separate from the drop side of the crib, creating a space that an infant or toddler could become wedged in, causing strangulation or suffocation. Drop-side cribs were banned by the government in December, although stores will not be forbidden to carry them until this spring. 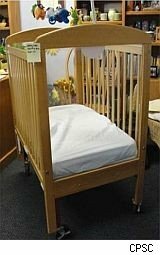 Babies R Us stores stopped stocking drop-side cribs a year ago. Learn more about crib safety here.